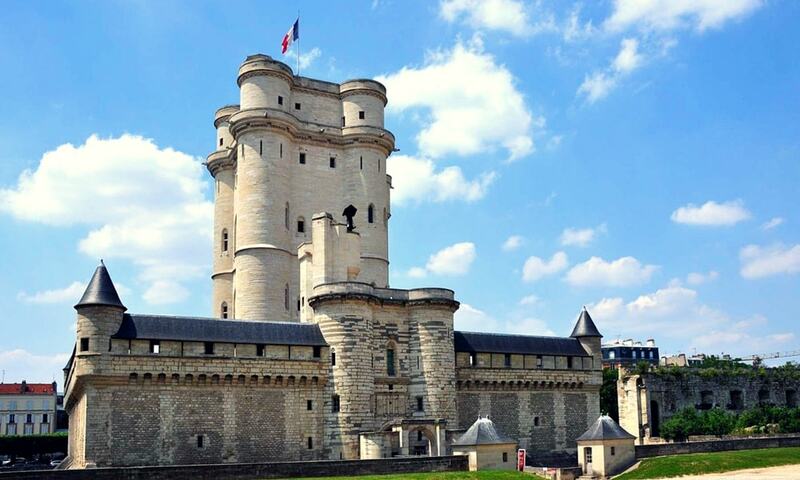 The Chateau de Vincennes is a massive 14th and 17th century French royal fortress in the town of Vincennes, to the east of Paris, now a suburb of the metropolis. It had its origins in a hunting lodge, constructed for Louis VII about 1150 in the forest of Vincennes. Philippe III (in 1274) and Philippe IV (in 1284) were each married there and three 14th-century kings died at Vincennes: Louis X (1316), Philippe V (1322) and Charles IV (1328). To strengthen the site, the castle was greatly enlarged replacing the earlier site in the later 14th century. A donjon tower, 52 meters high, the tallest medieval fortified structure of Europe, was added by Philip VI of France, a work that was started about 1337. The grand rectangular circuit of walls, was completed by the Valois about two generations later. Vincennes also served as the military headquarters of the Chief of General Staff, General Maurice Gamelin during the unsuccessful defence of France against the invading German army in 1940. It is now the main base of France's Defence Historical Service, which maintains a museum in the keep.